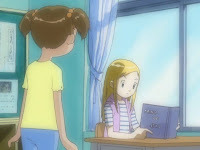 While Takuya, Koji and Tommy are at an amusement park, Zoe and JP get stuck at school for their adventure. It's eye-opening right there- an episode forcing together a girl and the guy who's trying to get in her pants. This is the second time they've gotten their own episode, although the last scenario was their choice and Zoe was mostly free to ignore JP. Not so here as JP's attempt to inject himself into a schoolyard conflict makes everything worse and Zoe is forced to yell at him about it. At least this one ends with their relationship normalizing to some degree. Last time we had a surprising example of Frontier handling something better than Adventure. Now it's topping Zero Two. Not because this is a good episode (it isn't), but because this JP/Zoe dynamic, and the spotlight on it, makes you realize one glaring omission in season two: we never got a proper Davis/Kari episode. He went from fawning over her to comfortable friends so gradually it was hard to notice. There's nothing wrong with that, but how great would it have been to emphasize this in an episode featuring these two during that crappy stretch in the BlackWargreymon arc? For a series roundly criticized for a lack of character development, why not bring out the little it did have? Just as the last episode primed us for Koji's family angst, this is the first we time hear any kind of backstory for Zoe. Half-Japanese, half-Austrian, her mother died when she was very young, leaving her caring for her younger sister who's cute as a peach but suffers from... wait, that's Thomas. Zoe's half-Japanese, half-Italian and... has nothing in common with the other girls at her school. That one's not as impressive by comparison, is it? 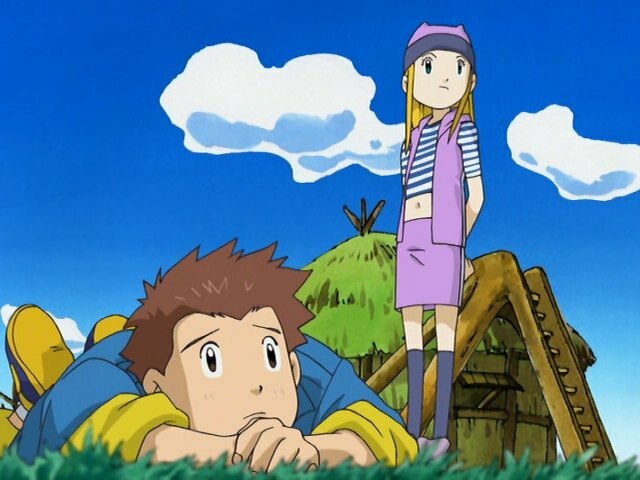 Other than Koji and Koichi, the Frontier kids all have very tame backstories, which is very rare for a show that loves to pour on bad, separated, and dead parents like they're going out of style (they're not). As a result, the problems they do have totally pale in comparison to what the twins have to deal with, and as a result are often glossed over, creating the impression that Takuya, Zoe, JP and to an extent even Tommy don't even have real world problems. At the same time, I'd wager there are far more people out there who struggle to make friends at school than there are half-Japanese, half-Austrians with dead mothers and sick sisters. Just because the angsty backstory isn't as bombastic doesn't mean it's not legitimate. Plus it's easier to manufacture situations like this where Zoe's minor problems and JP's minor problems collide with each other and make helping an ostracized Tsunomon more difficult than it should be. JP, who struggles with being alone in a crowd, tries to lavish attention on Tsunomon and make him feel special, which doesn't work since it's Tsunomon's uniqueness that's causing him to be excluded. Zoe, who refuses to change in order to be more sociable, assumes that Tsunomon is content with being on his own, which doesn't work because he's clearly bothered by the treatment he gets from his peers. It takes Tsunomon evolving to Gabumon to first save Zoe's life and then save a bullying Kapurimon to get some damn respect. In the end, it's hard to say whether either JP or Zoe learned anything from all this as Tsunomon's unique ability winning the day validates both of their unsuccessful strategies. For some reason, Zoe comments that she doesn't hate JP quite as much as she did before, which would be a nice way to end an episode if JP had done anything redeeming in it. 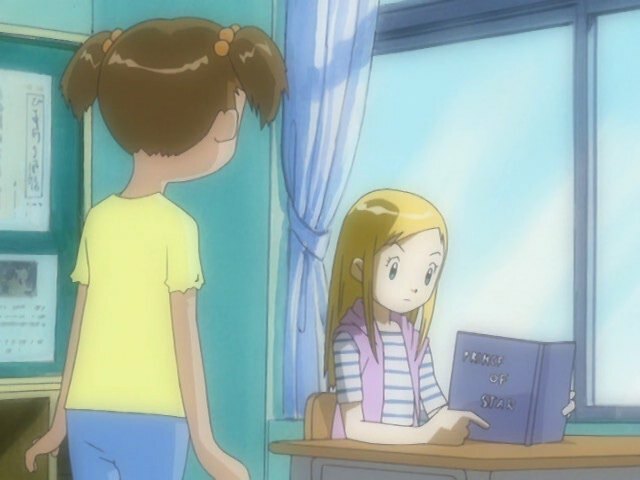 In a cute little touch, all of the students are Baby or In-Training forms of previous beloved Digimon. Gabumon's obvious, but you also have the younger forms of Guilmon, Impmon, Monodramon, Terriermon, Lopmon and Gatomon. There's a bit of overlap, but Baby forms of all three Celestials are present too. It's more subtle, but in the flashback one of the girls holds up a Wormmon charm. I get that we're mirroring the episodes of Adventure, but do we really need more stupid cutesy songs? In a moment of font horror, the writing on the chalkboard that hastily covers up the kana is in Comic Sans. Thankfully the dubbers realize the error of their ways and change it to something decent for future scenes. Did all you soccer fans like Kapurimon's Gareth Bale impersonation? 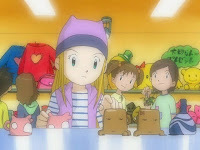 Eight little Digimon playing soccer, none of which are bigger than the ball. And yet one of them still takes a dive! So... how many damn chocolate bars does JP carry with him at all times? And why was he complaining about being hungry in previous episodes? Good effort and an awesome jump by Zoe onto that stump to try to save Tsunomon, but she fails to pick an In-Training out of the water, falls in and nearly drowns. She is awarded no points and may God have mercy on her soul. I would be really interested in the physics that propel this land-based sailboat. Because that thing really shouldn't work, and yet I want one. ...I think we all kinda want one of those boats. Even if we deny it. Nah, I want a land jet-ski. Am I the only one who found it weird that Togemon was the teacher? And had Garudamon's voice? It's a bit surreal. -Getting rescued by the baby digimon she attempted to rescue. Way to go.